The siding on your house and garage isn’t just for looks. Regular upkeep of your home’s exterior is essential to the integrity of your entire structure. If the structural components of your home have prolonged exposure to the elements, it will result in deterioration of the frame and lead to a much more expensive problem. Wood siding – If you’re hosting a graduation party next spring, you’re going to want your home to look its best. Painting is an option, but it’s costly, time consuming, and must be done before the snow flies. Maintenance-free siding can be installed any time of the year and is comparative to the long-term cost of wood siding. Therefore, now is the time to install upgraded siding. 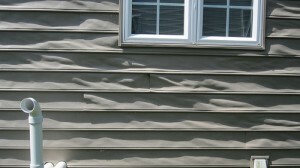 Vinyl siding – Older vinyl siding has a tendency to crack and fade. This will result in a decline in your home’s efficiency. Also, cracks and holes will expose the structure of your home to the elements. Aluminum siding – If you look at a 20-year old home with aluminum siding that has never been cleaned, you will notice how faded it looks. Over time, the paint on aluminum siding lightens and begins to look chalky. An upgrade to new materials will make your house pop again and will truly be maintenance free. While new siding will definitely make your home look new and beautiful, it’s about more than curb appeal. It’s important to maintain the structure of your home so you don’t get stuck with a much higher bill for more serious repairs. Maintenance-free siding can be installed at any point in the year. You don’t have to let the cold weather stop you from protecting your home! Contact us today to go over your siding options. Connect with us on Facebook, Pinterest, and Houzz to view our quality craftsmanship. Or, you can head on over to the BBB and check out our A+ rating!